After a successful solo exhibition with Praz-Delavallade in Los Angeles at the end of 2017, and participation at a couple of art fairs earlier this year, Guy Yanai will be opening his first solo show of 2018 at Conrads Galerie. Continuing his long-time collaboration with the Düsseldorf-based gallery, and pursuing his overall prolific output, he will be showing a new body of work titled Boy On An Island. Sparked around the artist's dream about a boy stuck on an island, this group of paintings see a revision to some of Yanai's most recognizable motifs, such as plants and boats, as well as the introduction of new imagery. Sadly, the title image of the show was never realized, but it was that idea that intuitively pushed the artist to chose the remaining images for the exhibition. Seemingly incoherent in their relations with each other, they are all images to which the artist can relate strongly on a personal level. Whether depicting the poolside of La Colombe d’Or hotel, a plant picture from an old Vitra catalog, an autumn image from Peanuts comics, or one of many images of boats, they are all portraying the nostalgia towards particular moments in his life. Painted using unique linear brush work, a style that flattens the image but still uses subtle tones to depict depth and light-play, these works intrigued us to the point we had to ask the Tel Aviv-based artist to tell us a bit more about it. Sasha Bogojev: Can you explain your interest or obsession with these boat images and why do you find them so appealing? 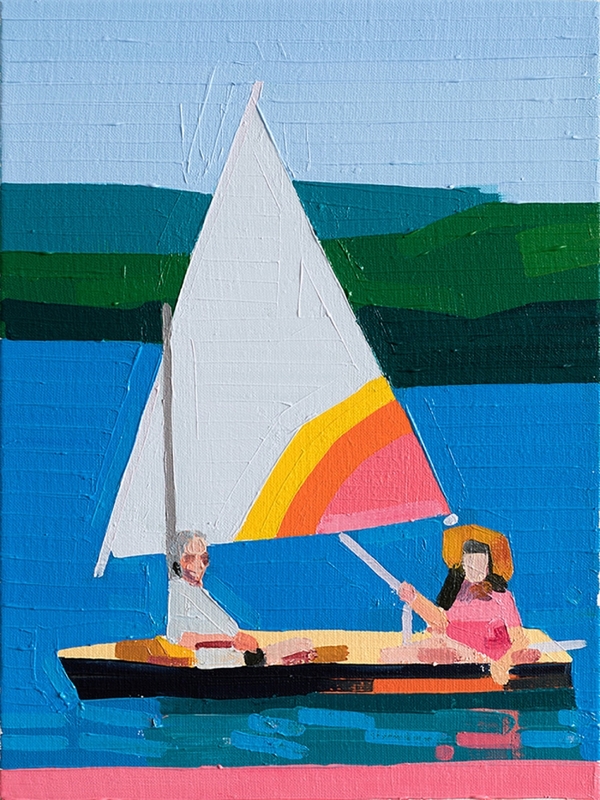 Guy Yanai: So the boats started about four years ago, maybe five. I saw this image of an old sunfish boat. I had a strange nostalgia looking at the image. Just the man sailing alone in the water really resonated with me. The endless paintings of boats kind of remind me of the palm trees by Josh Smith. People are embarrassed to like the works so much. Its definitely a double play, a love-hate. I do want them to be these coveted images, objects of desire! Most of the boats are from deep searches. It’s this kind of alchemy, finding these sources and translating them to paintings. It’s really endless, and I have to admit: I enjoy making these a lot. The ones for this show at Conrads Düsseldorf feel much more free and loose, less rigid and less perfect. What draws you to revisiting certain imagery, such as boats, plants, lighthouses, windows? I do paint the same subject matter a bunch of times. Sometimes over five times. Honestly, it's because I’m not done with it. I want to try out different options, different light, different color options, different sizes. It’s really endless. A few years ago I even said: Ok, enough plants. Then, somehow, I returned to painting plants. Most of the time, the subject matter is stronger than me. I try to not overthink why I paint what I do and why I do things over and over and over. I enjoy this obsessiveness. When did you develop your peculiar brush work and texture technique? Do you find it challenging to work exclusively in that manner? The brush marks just happened slowly, painting by painting. It’s a very nice way to work, and it makes every approach with the canvas have significance. It’s almost existential; like, I can't really make mistakes working like this. Most of the works at most have only three layers of paint. And, you know, they are not planned at all, I start anywhere. Was that something you were aiming for? How did it happen? It just happened slowly, by working a lot. When I was younger, I loved how Tuymans handled paint. At one point, I was making lines in my paintings, and somehow, I saw that people could tell when a line of paint was just nothing, just a line, and that line described something. That was really interesting. So, I tried making works built of lines. One of the works that stands out in this show is your piece, titled "Autumn," with the Peanuts characters. What is the idea behind it? The show is really intimate. Playing with leaves was something completely foreign to me until I arrived in the suburbs of Boston. The first time our next door neighbors rang our doorbell to play, we raked leaves and jumped in them. Coming from Israel, that was incredible; we had no rakes, no lawns, no leaves. I had this nostalgia for walking on leaves. Any plans on incorporating other pop culture elements in your work in the future? Really I don’t know. It happens very organically, I saw that image and I knew I had to make it mine. I’m very excited to show in Düsseldorf later this month, it will be my first show in Germany, an important country for me. In April, I will be doing Art Cologne. I am also working on three very large paintings that the MGM Nomad Hotel in Las Vegas commissioned. 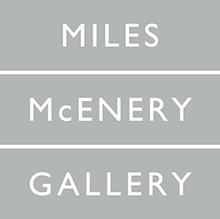 They chose two artists; David Hockney, and me, so I’m in good company. I’m also very excited to be doing a solo booth at FIAC with Praz-Delavallade in October of 2018.